Here it is — your chance to furnish your new room with the Calothamnus gracilis and the Iris confusa you envisioned all summer. The UC Santa Cruz Arboretum is hosting their fall plant sale on Oct. 12 at 10 a.m. in the Arboretum Eucalyptus Grove, featuring over 200 plants from around the world. This will be the Arboretum’s 36th year hosting bi-annual plant sales, giving students an opportunity to interact with an organization as intertwined with UCSC’s history as the roots it cultivates. In spite of humble beginnings, the Arboretum’s history is still blooming. Ray Collett and UCSC’s first chancellor, Dean McHenry, officially founded the Arboretum in 1964, and it has been a work in progress ever since. The Arboretum’s success is largely due to its incredibly diversified soil, Hall said. The Arboretum’s uniquely varied soil allows for the cultivation of a wide array of plants. These plants were imported from South Africa, Australia, Fiji, New Caledonia, New Zealand and different parts of California. Todd and Virginia Keeler, two of the first natural history graduates from UCSC, played a large role in shipping plants from overseas to the Arboretum. “On [Tod and Virginia’s] honeymoon departure, they asked Ray Collett if there were some things they might be able to collect, so Ray equipped them with lots of maps, lots of species lists and letters of introductions to various countries,” Hall said. Todd and Virginia sent the Arboretum plants from Fiji, New Caledonia, Australia and New Zealand. Creating a worldly arboretum has earned it a history as rich and bountiful as its soil. The Arboretum’s connection with the greater plant community spans continents, but it also has a symbiotic relationship with California. 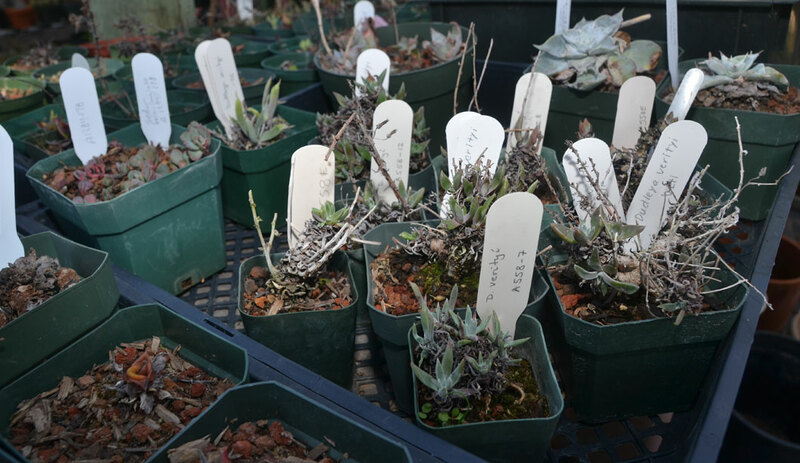 “At the Arboretum we have many species of endangered ‘live forevers’ [succulents] and many other California natives, which could be replanted in the wild, if needed after a catastrophe,” said director of development and research Stephen McCabe. The Dudleya verityi, one of the many plants that have been threatened by human interaction and flooding across the state, is a testament to the Arboretum’s diverse collection. Photo by Matthew Tsuda. Following a fire in Camarillo Springs this past May, much of the plant population known as Dudleya verityi — a rare succulent whose seeds are held on file at the Arboretum — was destroyed. McCabe has been in correspondence with a National Park service ecologist in order to determine the extent of the damage in Camarillo Springs and whether planting the Arboretum’s seeds is a necessary action. McCabe said that conservationists would rather watch plants, including the Dudleya verityi, regrow themselves in the wild because the same species can take on uniquely different identities depending on its environment, posing problems for relocation. Despite this concern, the Arboretum can still provide aid to areas in need. “The arboreta can be emergency back-ups for a limited number of species in the wild,” McCabe said. As much as the Arboretum impacts the greater environment, its impact on UCSC and the Santa Cruz community is felt even more strongly. “We run homeschool nature awareness programs [and] we also run occasional adult and family wild crafting skills workshops,” said Riekes Center director of nature awareness Ken Clarkson. The Riekes Center is a non-profit organization operating out of Menlo Park. The center has several branches including one at the Arboretum, where they have been for three years. The center’s homeschool nature awareness program is an interdisciplinary teaching experience utilizing teaching methods such as hiking, storytelling and journaling — all of which are done outdoors. As for UCSC’s relationship with the Arboretum, Hall could not emphasize their inseparability enough. “Students are really important to the original ideas, creatively speaking,” Hall said. The trajectories of UCSC and the Arboretum have always been parallel, especially since many people currently involved with the Arboretum are UCSC alumni.